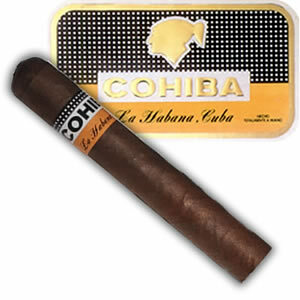 Cohiba Siglo I | Old Morris Tobacconist Victoria BC, Fine Cigars, Humidores and Tobacco Merchantile. Step away from the stresses of the everyday with this spicy little number. Sporting a 40 ring gauge, the Siglo I is the ideal 30-minute quick-smoke cigar. Clever and concise in construction, with rapid-burn tobacco that still allows for a brilliant and skillful progression despite its diminutive size.